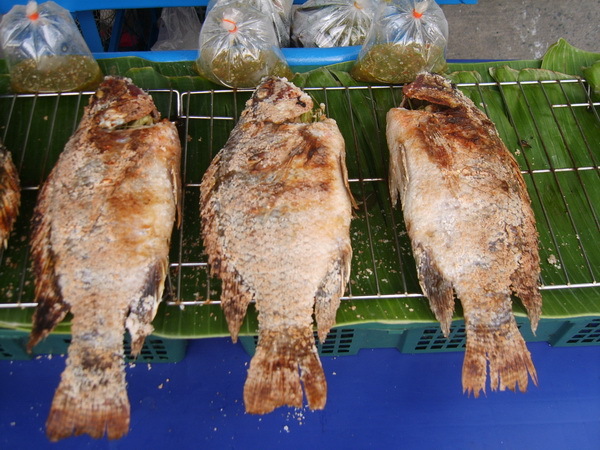 So lets explore Somdet Phra Pinklao, hasn't really got a lot going for it, a few hotels, a few massage parlours, the Phra Pinklao Bridge, a few places to eat and a few places to get a beer, if your walking then its a long walk between each stop as there really isn't a lot worth stopping for, likewise if your driving probably better to just keep on driving till you get somewhere more interesting, with the upper and lower level roadways, there seem to be about 20 odd lanes in all leaving Phra Pinklao, these were probably built so people could escape from there, yep it's pretty boring. 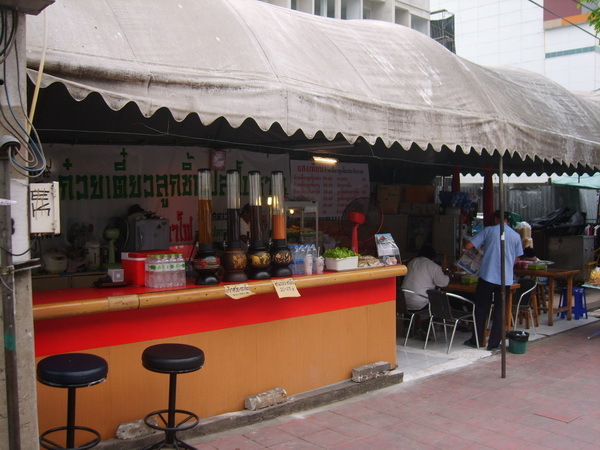 The food market is probably a good place for cheap eats, albeit Thai food only, also have cheap clothing, but if you want to go shopping your better off hitting the big markets or shopping malls which Bangkok is so famous for, so many to choose from there is no point in restricting yourself to here. Plenty of fruit for sale as there is in any Bangkok market, got to admit they do display it nicely, it may smell like dogs poo poo but they sure know how to display that durian to its fullest advantage, coming soon scratch and smell online durian orders taken. 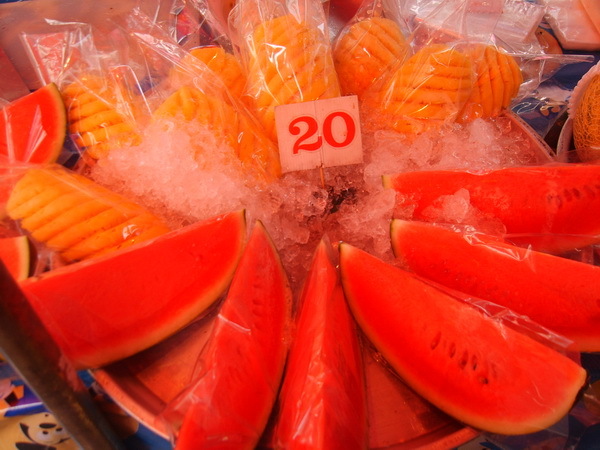 A picture of some more edible fruits, pineapple and melon, 20baht per slice isn't too bad a price. They only have signs up for the hotel in Thai, that includes the name of the hotel, but it has it's own parking out on the front lot. 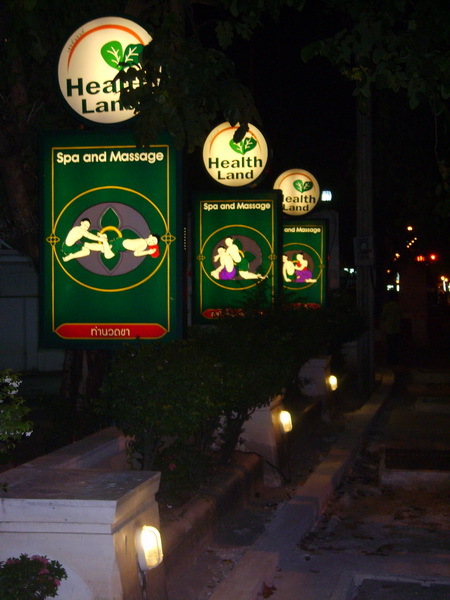 also under the hotel, it is easy to find if your driving as it is next door to Health Land Massage and Spa which has plenty of signs outside and a nice big car parking area out front. If your looking for Spa and Massage there is also Pinklao Spa and Massage down the road from here. The front of the hotel from the street, in front of the hotel is the parking lot. The large rooms in this thread are 5x7meters and cost 700baht per night. The bed frame is made from stainlaess steel, bet they will take a pounding, and the hotel isn't aimed at farang fatties, signage is only in Thai. Still they got a TV and a fridge with a freezer bit that doesn't quite freeze, nothing wrong with drinking your ice cream anyway, I do that all the time Also a small balcony which is shared with a great big noisy compressor and has lovely views of the roads and bridges. Bathroom has no hot water, this I wasn't too happy with, waiting and waiting I was for it to get warm, would have thought at the price range hot water would be de-facto so to speak. After all that you might fancy a nice spring roll to keep you going. A typical view of Phra Pinklao, various shades of dirty grey and grey, I was going to take some pictures of the shop houses, but over half seem to be empty and closed, the other half selling wedding dresses with a few high end places such as plastic surgeons and up-market dentists out numbering everything else, not really a place to meet your typical back packers, tourists or even your normal Thais. 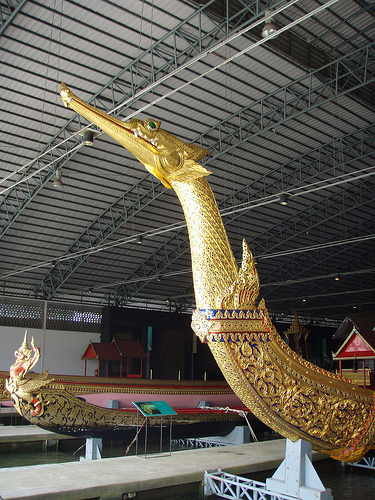 Isn't the royal barge museum in Pinklao? Yep, the Royal Barge Museum is there. Bit more going on than that Dog. Pata shopping center must have been close to where you were and a bit further down is a Central mall, right opposite a Major ciniplex. There are three big soapy massage places within walking distance, valentine 1 and 2 and one more -Chaopraya 3 maybe? 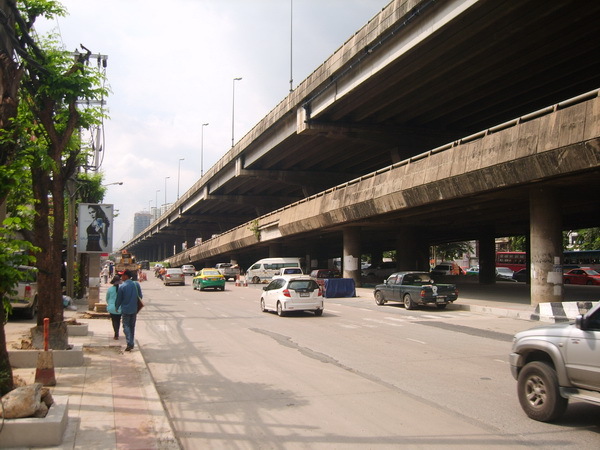 Traffic is usually slightly less than Bangkok proper, which makes it a nice place to ride your bicycle. which makes it a nice place to ride your bicycle. That was the first thing I thought to myself, I wish I had brought my bicycle with me, well, thats not quite true, infact the thought didn't even enter my head until reading your post, nope, I still wouldn't have bothered taking my bicycle with me, what a dumb idea. I think the Royal Barge Museum is a definate must see, they are very well presented. Had a look around Pata yesterday. It looks like something out of the 1970s and for some reason was full of elderly Chinese. Massage mmmmmmm.